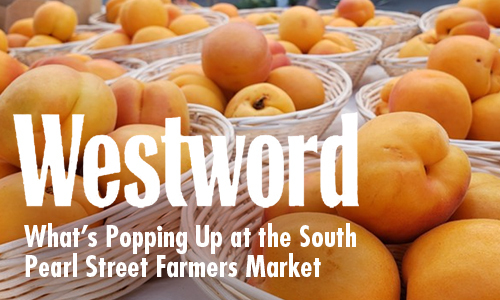 South Pearl Street | What’s Popping Up at the South Pearl Street Farmers’ Market According to Westword! Westword featured the South Pearl Street Farmers Market on July 9th: What’s Popping Up at the South Pearl Street Farmers’ Market! For the first time this year, I headed to the popular South Pearl Street Farmers’ Market, an institution that has graced the Old South Pearl Street area in south Denver for sixteen years. I was floored by the variety of vendors selling everything from meat to bath products to liquor and, of course, Colorado-grown produce. Right now, apricots, peaches, snap peas, dill, kale, cherries and green beans are all in season, but there are plenty of other fresh fruits and vegetables making a splash at the market. Every Sunday from 9 a.m. to 1 p.m., guests can wander the sunny street and see what’s in season at dozens of local farms, as well as check out two distilleries, two wineries, a couple of coffee vendors, two separate honey purveyors, four places that make natural stuff to slather on your body, and enough condiments to stock every summer barbecue from here to Labor Day and beyond.